Yep. 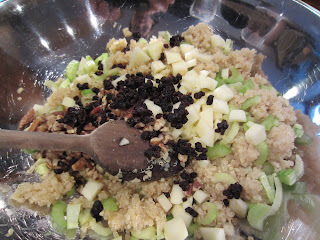 Another quinoa recipe. And this one is delicious if I do say so myself. Cook quinoa in the orange juice and water. (Combine them; bring to a boil; then reduce heat and simmer for 15 minutes or until all the liquids are soaked up!) Once it's cooked, fluff it up and set it to the side to cool completely. Slice up apples and celery. Add currants and pecans to the mix. Toss everything together in a large bowl. (I actually didn't use ALL of the cooked quinoa in the recipe - use your own discretion. But if you don't use it all, just put the remainder in the fridge to use in place of rice or pasta instead). You're gonna love it! I think that the pineapple juice is the real secret to making this delicious. I used pineapple juice from a can of crushed pineapple, but I don't see any reason why any other pineapple juice wouldn't do just as good of a job.